Do you want to lead a stree free life ? Then you must read this blog. College or high school students are probably one of the most vulnerable to stress and mental health-related issues. This stress is largely responsible for most of these students to become overweight, and also faces other negative physical effects. According to a current study, 7 out of 10 students have to deal with the mental problems of some kind or another. But why do students have to bear the brunt of it all? According to J. David Forbes, an MD from Nashville, Tennessee who happens to be a specialist in dealing with student stress-related issues, students, once they cross the threshold of college campus has to deal with a lot of things. They experience, what most experts say “a sizeable life-style change”. When students enter their college life, it is the 1st time in their life that they have to live on their own, without any jurisdiction from their adults. Now, this automatically allows them or rather tempts them to try out different things like taking a night out with their friends or anything else. Although they might not understand it, all of these ‘activities’ and lifestyle changes have a negative impact on their subconscious mind. Why does stress occur in the 1st place? Stress is a negative state of mind when your level of tension hugely exceeds the energy level of your body. Now, this condition is a classic example of what students have to face! The reason for saying this is because not only do they have to worry about their exams, assignments, lectures, etc. but as they are also involved in doing part-time jobs and are involved in extra-curricular activities, they hardly get any time to take a break. Over time, this weighs heavily not only on their body, but also on their minds, as their tension levels far exceed what little amount of energy they have in reserve. So, the main question here is what is to be done to reduce this stress, right? There are certain techniques that experts recommend every to follow whenever they feel like overburdened by the weight of their college life. Whether you are a student or not, not getting sufficient sleep is one of the primary reasons for a majority of the stress related issue. Now, if you are a fresher, it is natural for you to be tempted by the suddenly found independence that you have got, and this temptation might lead you to stay awake till late at night and attend lectures on the next day. But have you wondered what might happen in the long run? Well, first of all you will slowly start to wear out easily than you normally used to. This means that your stress levels are bound to go up significantly. And, it is not only your mind that gets affected, but you also risk developing serious illnesses like diabetes, obesity, and even depression. Therefore, doctors around the globe suggest youngsters to keep their body clock aligned with the clock of the sun i.e. go to sleep by or before midnight and wake up after 7-9 hours. Although this generation of students are highly health conscious, the harsh reality is that a majority of students still prefer fast and junk food simply because of their cheapness and convenience. However, this kind of diet will make you grow mentally tired. Plus, the threshold of your stress level will decrease over time. It is particularly for this reason that experts like Dr. Forbes suggest that you stack your dorm room or apartment with healthy foods like fruits and vegetables. This will not only replenish the fluid level in your body, but you will also feel fresh and hydrated all the time; one of the key antidote to stress. Nowadays, you do not even have to buy coffee as there are caffeine pills available. And if that does not work for you, then there are prescription medications that will provide you with the necessary energy boost needed to stay awake for a late-night study session. However, according to experts this is an extremely dangerous route to take, as not giving your body the rest it requires can make you susceptible to stress. At all cost, try to avoid taking on more than you can handle. That is to say, if you have signed up for a number of courses, it is absolutely alright to skip a few. 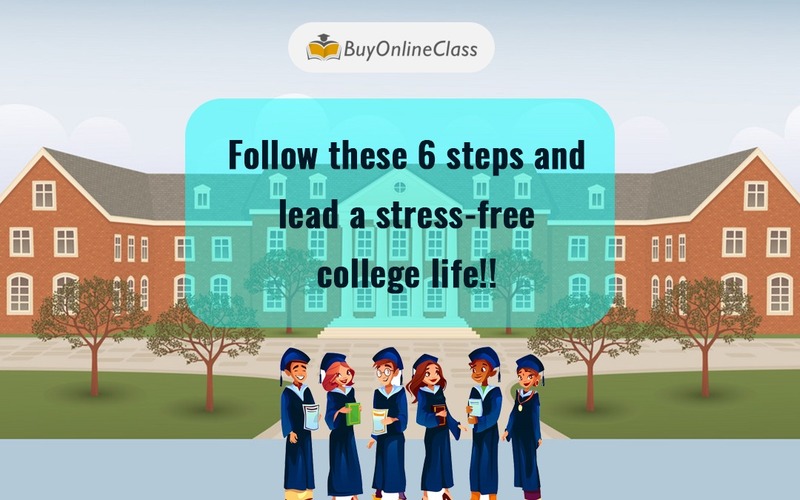 Also, if you find maintaining regular attendance in your college is becoming too much for you, then try to make use of educational websites like Buy Online Class; a website amongst many others which specializes in giving online tutorials to students who are having a hard time attending lectures regularly. When you leave for college you also leave behind your friends and family members who have been your support system all this time. This can force students to fall prey to loneliness as they have not yet formed a close circle in their respective colleges. Indeed it can be a stressful situation, to say the least! Irrespective of whether your college is near your home or abroad, the thought of living away from your family and friends can take a mental toll. Therefore, in order to avoid this, always make a point to stay connected with your loved ones. A quick chat with your mother over the phone can make you feel a lot lighter. This is yet another way of staying away from loneliness. Reach out and join various clubs or groups. You can even try joining an exercise class which will give you an opportunity to break the shackles and make new friends. It happens with everyone – whenever you feel stressed out your mind does not allow to do anything at all, let alone exercising. However, even moving around for 15 to 20 minutes along with deep breathing will help calm your nerves. On top of that, exercising releases dopamine which is a neurotransmitter and is responsible for making you feel good.